We've got you dialed in. The right VoIP Phones for your business must push all the right buttons. Whether you run a mobile delivery team or control a 1,000-person call center, CompuVoIP can hook you up with the most advanced VoIP phone hardware available on the market today. Here's a short overview of the telephone system new york we offer. Visit our Rebate page to learn more about obtaining your phone of choice at no cost. Designed for better, smoother business. As an answer to the needs of entry-level IP phone users, Yealink’s T19P features quality materials and performance benchmarks quite uncommon to this market segment. An intuitive user interface and enhanced functionality which make it easy for people to interact and maximize productivity. Yealink HD technology enables rich, clear, life-like voice communications, outsourced management options, flexible deployment and third-party communications applications. Designed by pursuing ease of use in even the tiniest details. Delivering superb sound quality as well as rich visual experience. A feature-rich SIP phone for business. The most advanced model in the T2x IP series, its high-resolution TFT color display delivers a rich visual experience. Support for Gigabit Ethernet, and EHS and USB ports round out the productivity enhancing features of this phone. Connecting standard encryption protocols with a vast array of productivity-enhancing features, the T41S enriches the SIP phone user’s experience. It is even capable of performing highly secure remote provisioning and software upgrades. As the flagship model of Yealink’s audio IP phone line, the revolutionary T46S remains the choice of executive users and busy professionals. Support for a variety of device connections includes EHS headset and USB. The T48S invades new frontiers in IP calling. It offers particular features that set it apart as the go-to choice for both local and international use by business, industry and commerce. For long-distance calls, look no further. The Yealink W60P, a high-performance SIP cordless phone system, is the ideal solution for small and medium-sized businesses. 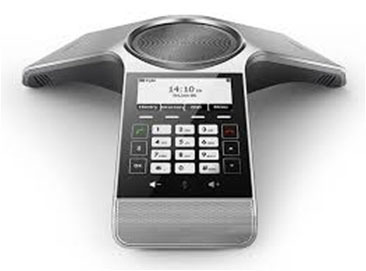 Pairing with up to a total of 8 Yealink W52H/W56H DECT handsets, it allows you enjoy superb mobility and efficient flexibility and eliminates additional wiring troubles and charges. A perfect choice for small and medium-sized conference room that meets the demands of up to 16 people with optional expansion microphones. The Yealink CP860 also supports call recording, plus linkages to mobile phones or PCs for a more convenient conference call experience. The T58V supports HD voice and video communication. In addition to an adjustable seven-inch touchscreen interface, the phones enable users to access lifelike video calls easily and to adjust the viewing angle flexibly. Increase communication productivity by making every conversation clear, comfortable and focused. * Provisioning fee additional, System add-ons not eligible.